By now you might have known my love for eggplants, they are so good and my all time favorites – I just can’t get enough of these! So, here is a complied post on how I involve eggplants/baingan in my day to day cooking – 7 ways to cook Baingan or Eggplants. In Indian cooking, there are so many ways to prepare/ cook eggplants, I will go through some of them- eggplant pakodas, bharwan baigan (stuffed eggplant), baghare baigan, Alu baigan ki sabzi (next on my list) and Tawa sabzi, just to name a few. Each recipe featured below has special ingredients and includes a certain style of preparation. For example, bharwan baingan and baghare baingan recipe may look similar but the cooking method is totally different. Also included in the list is a lip-smacking Khatte methe baingan recipe prepared by my dear friend – Sonal Gupta (a talented food blogger). 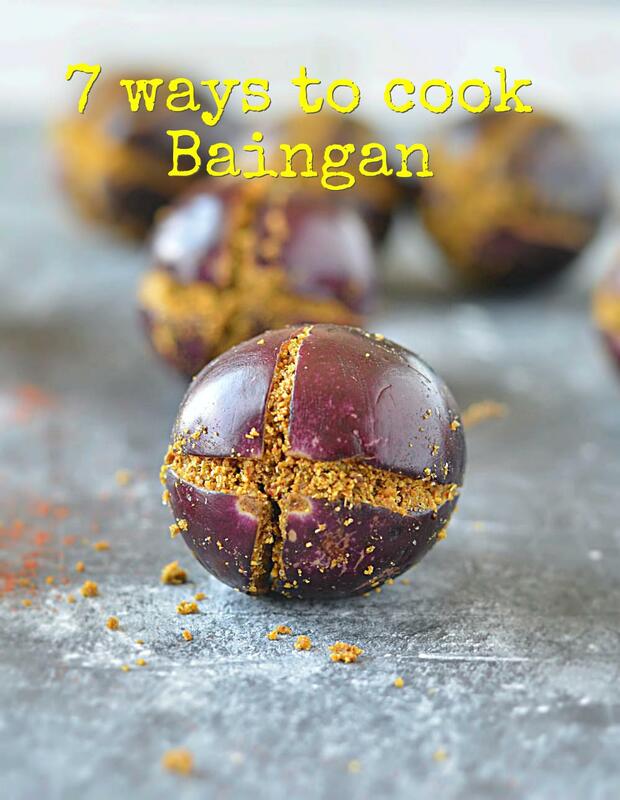 Do give these yummy 7 ways to cook Baingan or Eggplants recipes a try – they are loaded with flavor and super easy to make. Pair it with your favorite dal, rice and rotis for a perfect weeknight meal! BHARWAN BAINGAN RECIPE – Enjoy these healthy and delicious baby eggplants that are stuffed with medley of spices and peanuts. Now this is what I call comfort food – surprisingly easy to make vegan and a gluten free recipe! Bharwan baingan recipe is a no onion no garlic dish, but if you would like to add more flavor, add sauteed onions and garlic to it. KHATTE MEETHE BAINGAN – Get your taste-buds tingling with a lip smacking and delicious recipe from Sonal Gupta. This recipe is full of flavor, and you will love the sweet and sour taste it has to offer. Easy to prepare, and a perfect blend of flavors! BAINGAN KACHRI – An aromatic and delicious way of enjoying eggplant fritters. Baby eggplant slices are coated with a besan spice mix and cooked until it gets a crunchy outer layer and on the inside its still soft and velvety. BAGHARE BAINGAN – A specialty of Hyderabadi Cuisine! Baghar means tadka /tempering and baigan is referred to as eggplants meaning “Eggplants cooked with a tadka”. Baby eggplants/baingan are cooked in cashew – coconut gravy and flavored with tangy spices. This dish is pretty close to the traditional Hyderabadi baghare baingan but not exactly like one. BAINGAN BHARTA – Everyone is familiar with this dish, a staple in every household and everyone enjoys it. Roasted, skinned and mashed eggplant sauteed with onion, tomatoes and Indian spices makes it a great punjabi dish. TAWA SABZI – As the name suggest tawa sabzi means array of seasonal veggies that are spread around a hot tawa/griddle and when asked that particular veggie gets all the attention 😉 . It is brought in the center of the griddle; tossed in masala, sprinkled with chaat masala and served to the guests right off the hot tawa. Sounds interesting.. isn’t it? It’s utterly delicious. EGGPLANT PARMESAN– Pan cooked Eggplant Parmesan Stacks topped with a homemade marinara sauce, shredded mozzarella, and fresh herbs.Truly one of the amazingly delicious dinner recipe!! It’s a real meal, full of flavor, hearty and healthy. Oh and did I forget to mention, it’s ah-mazingly delicious!! If you happen to make any of the above recipes (7 ways to cook Baingan or Eggplants), please leave me a comment or share your pics with me @Facebook. I would love to see your creation and would be happy to answer any questions. Cheers! Please use the search option. There are many vegetarian and no onion no garlic recipe on the blog. Thanks!